The summit has come and gone and many of us are breathing a little easier knowing that nuclear destruction has been avoided for another day. In true Singaporean fashion, the only way to celebrate our role in the historic Trump-Kim summit was with a party. Overlooking Sentosa’s shores the rooftop restaurant, Propeller, hosted their own end of Summit-Summit. The Bay Hotel celebrated the countries steps towards peace, making their own mark on this historical event. The event included food, drinks, and special appearances by “Trump” and “Kim” themselves. Of course the real Trump and Kim could not be in attendance, but the impersonators were hauntingly realistic. I got multiple texts from friends after posting photos of the event wondering why I was posing next to the infamous dictator. 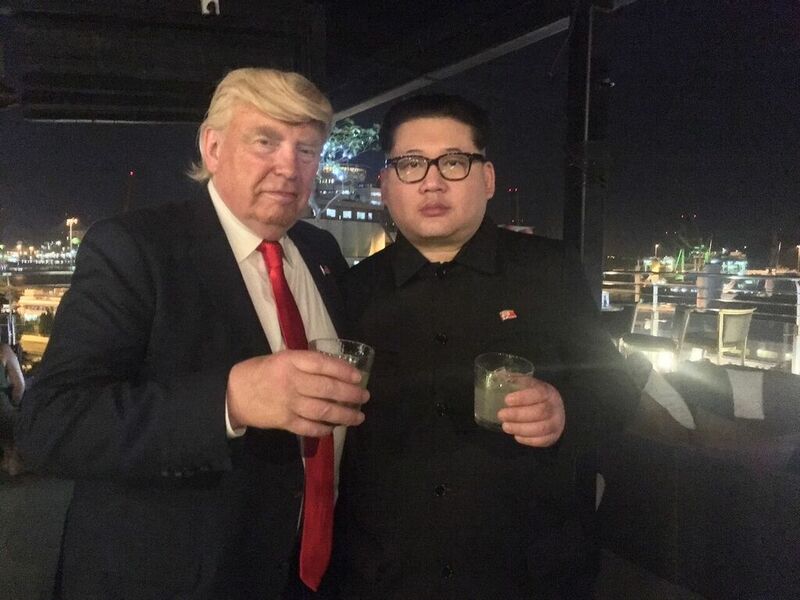 With nuclear tensions avoided, “Trump” and “Kim” ended the event by defusing the “new clear bombs.” The drink created by the bar is a fusion of Korean and American, paying tribute the new found friendship between the two countries. A shot of American Bourbon and the traditional Korean drink, Makgeoli, made a sweet but strong cocktail. Unfortunately the “once-in-a-lifetime” nature of the summit means the chances of a repeat celebration are slim, but the image of Trump and Kim taking a shot together will be permanently burned in my brain.